We’ve been hanging out at the public library a lot this summer. My 10 year old figured out how to request books on line. He now has a steady stream of books to pick up from the reserved section all week long. Once we’re in the library, the kids always want to sit and read a bit. While they get their library fix, I’ve taken to browsing through the cook books. Amazing how many cook books there are! I love looking at the gorgeous food pictures and reading snippets about the cooks themselves. I’m also always looking for inspiration on what I can cook next for my family. Last week I picked up The Perfect Peach by Marcy, Nikiko & David Mas Masumoto. It’s a beautiful book. Stories from the authors’ daily lives. Recipes. Pretty pictures. And even a page on “How to prune and thin a tree” by Mas. Spinach salad with peaches. I botched their recipe for the peach vinaigrette (who messes up vinaigrette?!). So we just used other dressings we had on hand. Still, the salad went well with my favorite fried chicken and corn on the cob. 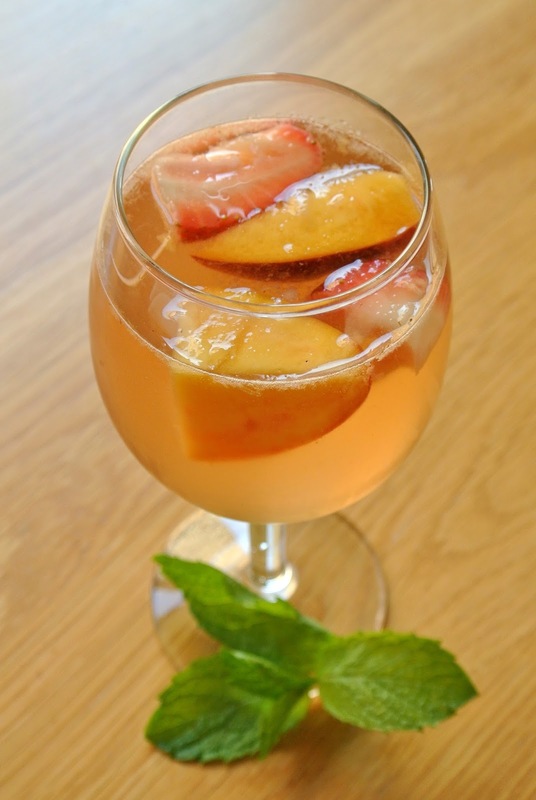 Summer sangria. In my mind, the words “summer” and “sangria” are synonymous. Of course I had to make the sangria. Peach crisp. 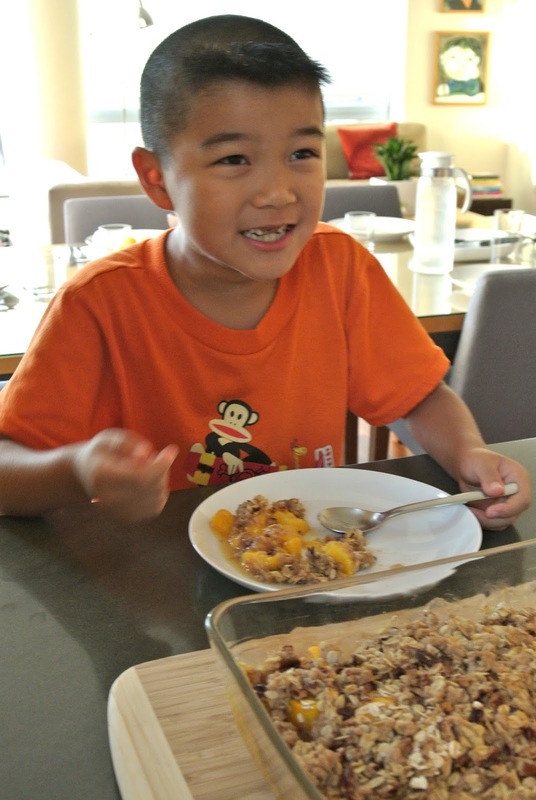 My littler boy, E, joined me to make this dessert. It smelled so yummy he just had to sample a plate as soon as it came out of the oven. I chose three very basic recipes from their book. I also must confess to buying my peaches at the grocery store – so much less satisfying after reading about peaches freshly harvested on the farm. Sigh. Still, I thoroughly enjoyed reading the book, had fun picking the peach recipes to try and was happy to dig into our peach-inspired meal. Would love to stay & chat some more, but I’ve got to fetch the boys from camp. I believe Si has books waiting for him at the library – which means it’s time for me to look for more cooking inspiration! The question of chores. This topic comes up from time to time amongst my parent-friends. Do your kids have regular chores at home? Are they paid to do said chores? How much reminding do they need? How old were they when they began helping out at home? Are they actually proficient when working or are they just creating more work for the parent? I think it can be helpful to hear how different families handle this. And, since my friends with young children occasionally want to to know how we do things at our house, I thought I’d blather a little about our family’s approach to children & chores. Do your children do chores around the home? If so, what are they responsible for? Yes. Both Simon (10) and Ethan (7) have daily responsibilities. While both boys are capable of handling everything on the list, they prefer for Simon to deal with the garbage & for Ethan to help in the kitchen (remember last year’s post – Sous Chef & Garbage Boy?). Do they have to be reminded to do their chores? Yes. Although I don’t really think of it as reminding them. It’s more like they are on call. When I need a boy to do something, I let him know & he takes care of it. Are they paid for doing chores? Although we don’t pay for chores, each boy does receive a weekly allowance of $5. In case you’re wondering – they can save or spend their allowances as they like, but they are also responsible for covering the cost of any birthday gifts to their friends throughout the year. How old were they when they started helping out around the house? One night, when Simon was 2 years old, I was collapsed in exhaustion on our living room floor. I gazed at the ceiling and stated aloud (to no one in particular) that I wished I had a pillow. Si stared hard at me for a moment, then his face lit up in a huge grin. Little boy toddled out of the living room & into my bedroom. He returned moments later dragging my pillow (which, at that time, was bigger than he was). That’s when I realized he was old enough to help me around the house and that he wanted to be helpful and was proud do be part of the day to day work. Are they actually helpful? Or is it just busy work? Yes. They really are a huge help. With the boys scrubbing vegetables, folding laundry, taking garbage out, etc – we really do power through all the work in no time at all. We chit chat our way through what must be done, then we have more time & energy to read an extra chapter during our daily read aloud or to head out to play. And yes, in the beginning, sometimes it did feel like I was creating “busy work” for them. When they were 2 & 4, I could’ve done it all much more efficiently myself. But really, it was worth the extra time & patience to teach them how to sort recyclables, scrub vegies and fold shirts. Today, Simon folded two loads of laundry while Ethan and I cooked pasta & sauce for tonight’s dinner and then a pot soup for tomorrow’s dinner. I consider that truly helpful. Now it’s your turn – What do you think about this question of chores? This is our second summer to enjoy a farm share from The Battery Urban Farm. I feel so lucky to be able to walk out of our high rise apartment building, take a 5 minute stroll to the farm and pick up my share of beautiful fresh produce. Talk about local – I don’t think it gets any more local than this in NYC! This season, the farm introduced me to my new favorite vegetable – collard greens. Now, I have eaten collard greens before. But only in restaurants and only as a side dish with BBQ ribs. I associated collards with salty, fatty and oily foods… which I must admit, I do think tasty, but collards didn’t make it onto my list of favorite vegetables.. until this summer when that first big bouquet of collard greens showed up in my farm share. I wasn’t sure how to prepare the greens, so I searched for a recipe on the internet. I decided to try this recipe from epicurious. So glad I did. I cut the stems off the collards, then layered 3-4 leaves on top of each other before cutting into big pieces. I like my greens chewy and my farm share collards looked quite tender, so I blanched the greens for less than 5 minutes (as opposed to the 15 minute cooking time in the original recipe). Every delicious stir fry starts with olive oil, salt and garlic (lots of garlic) in the pan. After a quick stir fry, I squeezed fresh lemon juice over the collards. And then I devoured this whole plate of collards myself. My next farm share pick up is in 3 days. Hoping to get another big bouquet of collards. Maybe this time I’ll share the dish with my family! Thank you Urban Farm! Moving right along with our Rick Riordan summer reading plans. We’ve started The Battle of the Labyrinth – the fourth book of the “Percy Jackson &the Olympians” series. Still thoroughly enjoying the adventures of Percy and all his demi-god buddies. Still having long discussions of which characters existed in the original Greek mythology and how Riordan has used them in his series. Si & I want to up the ante on our reading challenge this summer. We want to finish this series and read the three that are out from his next Olympian series. Six weeks left of summer vacation to power through five fat books. We’re going to try! 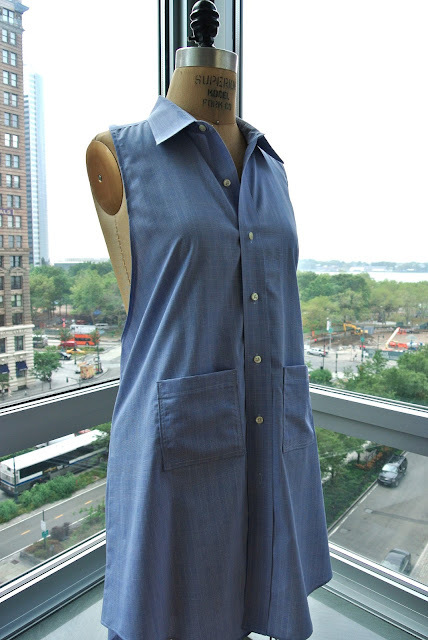 I have a really neat upcycling project to share with you today – remaking a men’s dress shirt into an apron. I came across a brief tutorial for this when cruising around pinterest. I thought the idea so clever, I immediately had to make it for myself. As usual, I only loosely followed the instructions. Let me show you what I came up with. I left more fabric across the front so if you look at my apron straight on, it actually looks like a dress. Cute, huh? I added two pockets made from the shirt sleeve. They are the perfect size to hold my cell phone, a pen or even a small needle book (‘cuz you never known when you’ll need to whip out needle & thread). 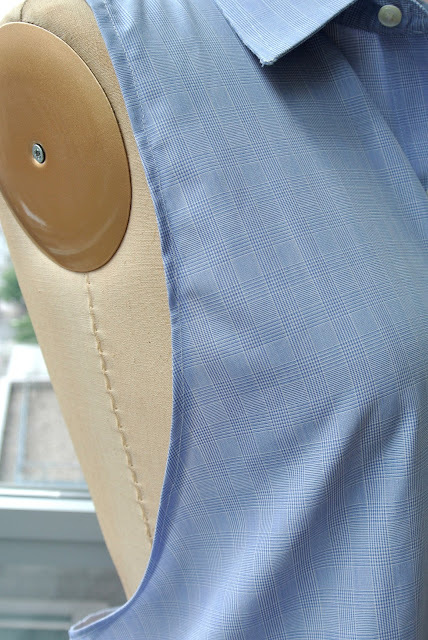 The most difficult part of this project was pinning and finishing the curved edge that forms a big circle from collar, around the front, under the arm and on through until ending up at the collar again. I practiced lots of slow yoga breathing while finishing this troublesome edge. 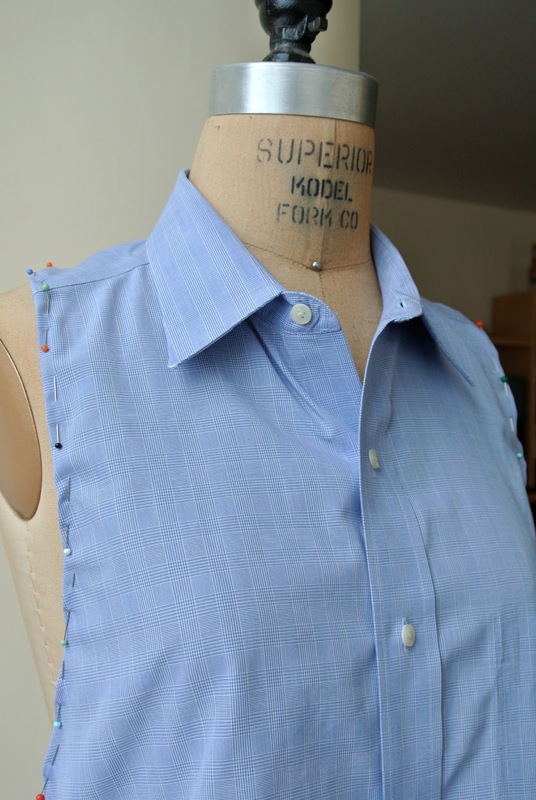 I pinned, pressed, measured and pinned again for a really long time before finally going to the sewing machine. The end seam is not perfect, but I’m satisfied with it. 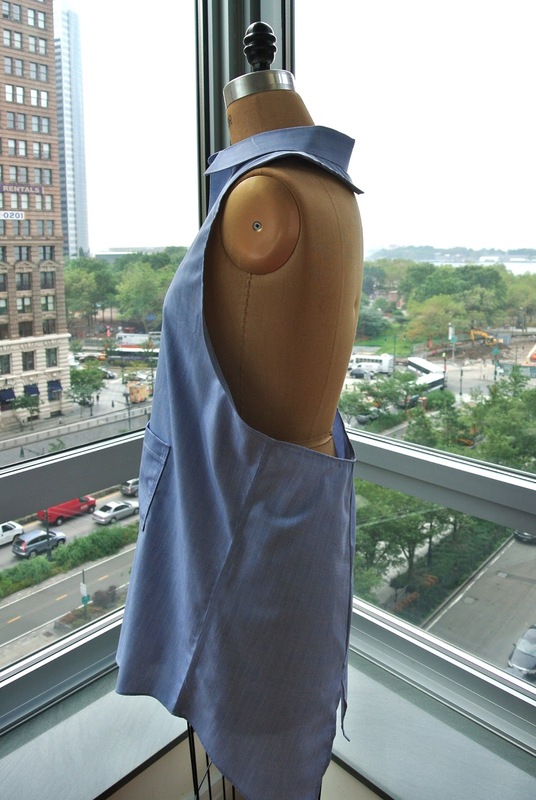 I opted to sew the back of the shirt back together instead of making apron ties. I love the look of the closed back and the little vent at the bottom. One part that I’m not pleased with is the rounded piece behind the collar. I’d intended for it to lay flat, but it insists on flipping up. 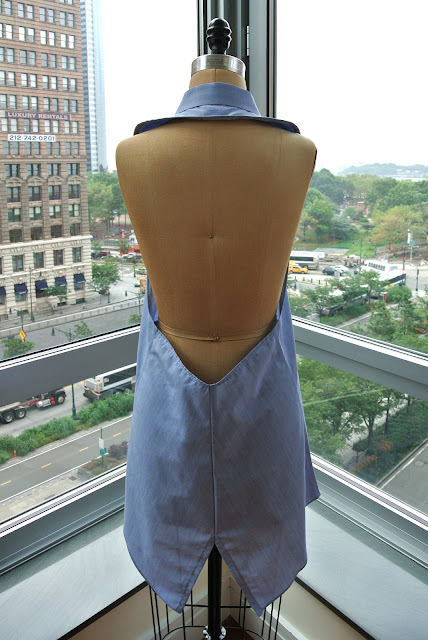 I’m going to make another variation of this apron (with my seemingly endless supply of dress shirts from my husband’s toss pile). Next time I’ll to cut diagonally from the center back of collar – hope that will do the trick to make the part under the collar easier to finish and look smoother. I’m anticipating wearing my new apron a lot. In fact, I think I’m going to put it on right now. I get such a kick out of this pretty, yet functional piece that it just might make doing tonight’s chores a little more fun (are “chores” and “fun” an oxymoron? ).